How to decorate with this fashion-approved palette. Not feeling the bold primary color trend for spring? There’s another borrowed-from-the-fashion-runways palette that coincidentally works perfectly for warm weather: pastels. We’ve seen the soft hues paired together for a decidedly summery palette everywhere from Celine to Victoria Beckham to Preen, projecting that this combination of colors is definitely going to be one to watch in the upcoming season. The great news is that this is a trend easily translated to our homes, too. Ice cream pastels have already been creeping onto the design stage for a while now. Millennial pink, anyone? Or its successor, millennial lilac (which designers are already on board with)? Whether mixed with other soft pastels or juxtaposed against more industrial materials and modern lines for an edgier take on the feminine, this muted color combo is one we can’t wait to copy. Read on for some of our favorite pieces that’ll help you bring this trend home, no matter your personal style. Place on a table or mount on the wall; the coolest thing about this lamp—besides the mauve color—is its versatility. And this goes beyond just where you put it. Thanks to a flat, circular dish, you can adjust the lightflow to accommodate your needs. Keep it fully open for when you need to work, and close it slightly for a softer glow when you want to relax. The slight catch is that this piece won’t ship until December 2018, but you’ll want to pre-order now as something tells us it won’t be available for much longer. A sure-fire way to brighten up any summer tablescape, this sunny porcelain piece is simple, timeless, and perhaps most importantly, super affordable. Pick up a few for a full set—or take a note from Loewe’s multicolor ode to pastel and mix and match the pale yellow with the powder pink and dusky green options. If you have a caffeine addiction, you may as well fuel it in style. 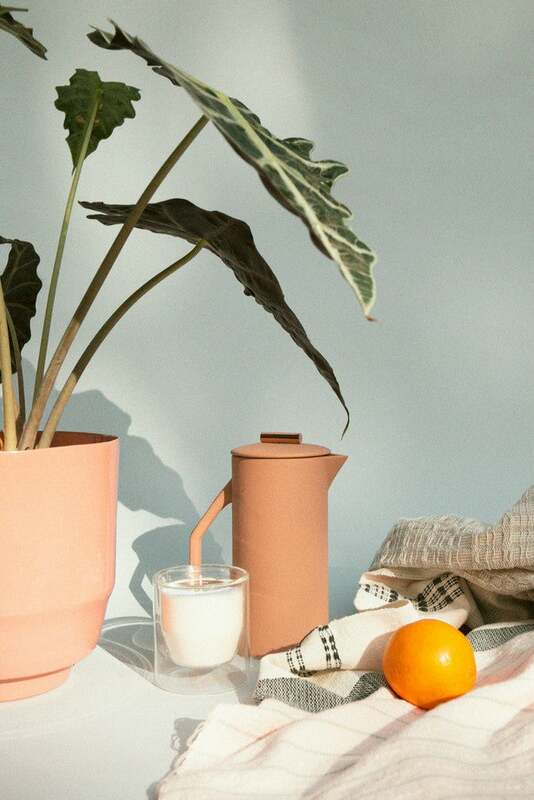 Cut down on Starbucks expenses and add a stylish kitchen countertop accessory in the process with this gorgeous ceramic french press, available in a light coral hue with copper hardware. Frequent brunch hosts, this one’s for you. There’s something to be said about investing in neutral-toned furniture in classic designs you’ll be able to keep as the base for your evolving style… but there’s also something to be said about fun colorful accents like this side table that may not be the most sustainable in the long run, but will surely liven up any space they’re placed in. The added storage is a definite plus. A kaleidoscope of faded pastels, this wool rug will make your bare floors sing. It’s available in a range of sizes, too, so you aren’t limited by the constraints of your square footage. Hop aboard the geometric decor trend and try your hand at two of-the-moment styles at once. Now that you know how to keep your flowers alive for as long as possible, it’s time to find them a home. A strong case could be made for this sleek lilac vase, which is perfect for both elaborate bouquets and more minimalist arrangements. You don’t actually have to take this towel to the beach—though if you did, it would likely be the most stylish one there—because it also works well as a picnic blanket, an outdoor throw, or even a bath towel. Ombre blues and pinks get the nautical treatment via a chic striped design. A matte stoneware finish coupled with clean lines and minimal color make for quite the contemporary dinner collection. We love the subtle seafoam color, and the under-$70 price tag even more. Who said good style has to be expensive? While we still love ’em, woven baskets have become so popular they’re rapidly veering toward the cliché. This iron wire option is a fresh take on the storage item that will add interest to whatever nook you relegate it to. Use in the living room as a home for throw blankets or magazines, or even as a fashion-forward mini hamper to keep your laundry room organized. A hand-blown glass “bedside” carafe designed to look inexplicably like a light bulb just may be the height of superfluous luxury. However when you consider its other uses—as a vase, for example, or a sculptural art piece to dress up an empty table, or a replacement for your desktop water bottle being that the top is actually a cup—and the gorgeous lavender and mint pairing, it may just be one of those superfluous items you actually need. Whether you’re an art rookie just starting to build an art collection or an old pro on the hunt for a new piece to add to your already-impressive gallery, consider this canvas. Featuring a blend of pastels, some more saturated than others, it’s a beautiful piece that will bring a pop of color to your home.